The share of independents in the United States stands at its highest point in more than 75 years of public opinion polling. However, a substantial majority of independents have not fully declared their independence from the two major parties. Most say they “lean” toward a party. As we found in our recent study on political animosity, partisan leaners don’t have especially positive views of the party they lean toward, yet they feel very negatively about the opposing party. Nevertheless, partisan leaners share many of the political values of – and tend to vote similarly to – members of party they lean toward. 1 Independents outnumber either Democrats or Republicans. A Pew Research Center analysis that examined partisan affiliation from 1992 to 2014 found that, in 2014, 39% of the public identified as independents, which was larger than the shares calling themselves Democrats (32%) or Republicans (23%). In 2004, roughly equal shares identified as Democrats (33%), independents (30%) and Republicans (29%). 2 The most frequently cited factor for leaning toward a party is the harm caused by the opposing party’s policies. A majority of Republican leaners (55%) and roughly half of Democratic leaners (51%) cite the other party’s policies being bad for the country as a major reason why they lean toward their own party. By contrast, just 30% of Republican leaners and 34% of Democratic leaners say that their own party’s policies being good for the country is a major reason why they lean toward their party. 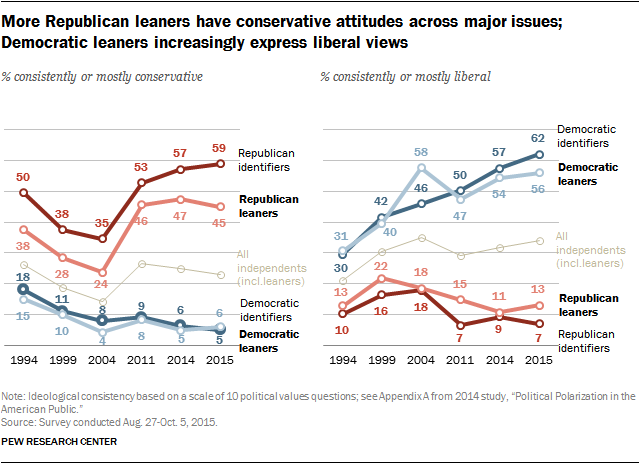 3 Independents who lean toward a party do not feel very warmly toward its members. When asked to rate Republicans and Democrats on a 0 to 100 “feeling thermometer” – where 0 is the coldest, most negative rating and 100 is the warmest, most positive rating – partisan-leaning independents are not very warm toward members of their own party. Fewer than half of Democratic leaners (45%) give a warm rating (more than 50) to Democrats; even fewer Republican leaners (38%) feel warmly toward Republicans. 4Partisan animosity has increased sharply among independents as well as partisans. For the first time in surveys dating back more than two decades, majorities of Republicans (58%) and Democrats (55%) say they have a very unfavorable view of the opposing party. 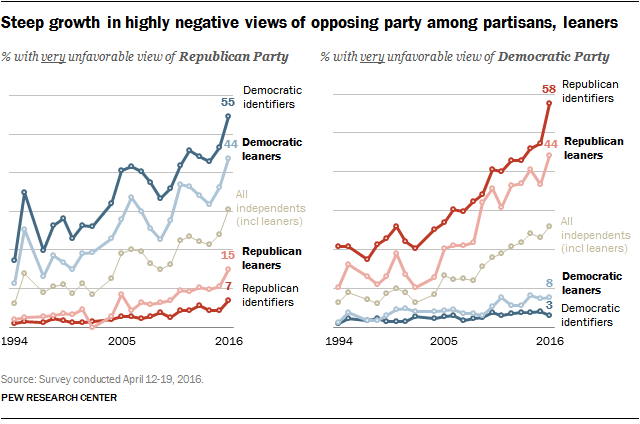 In 1994, fewer than half as many Republicans (21%) and Democrats (17%) expressed highly negative views of the other party. 5Increasing shares of independents and partisans express ideological views on major issues. Pew Research Center’s major study of political polarization in 2014 found a rise in ideological attitudes among both Republicans and Democrats over the past two decades. 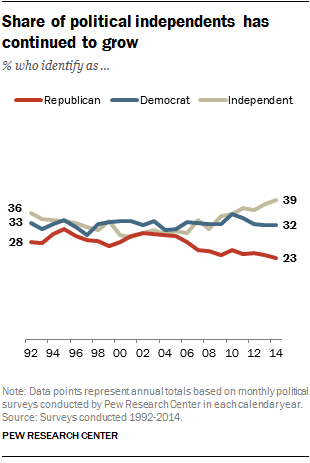 The same trend is evident among independents who lean toward one party or the other.